Upgrade from factory 1G alternator to 3G style and retain your factory wiring and gauges. This kit is made specifically for the installation of a Ford 3G alternator on any vehicle where the stock alternator was EXTERNALLY regulated. 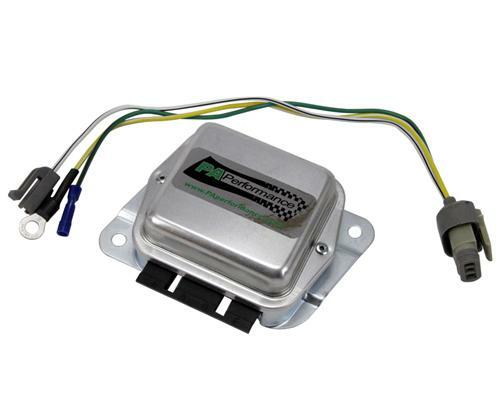 PA Performance incorporates a new replacement external regulator box (as shown) to capture the proper circuit and retain the stock wiring harness along with our own 3-wire (3G Series) regulator plug. This kit allows the customer to retain the OEM warning lights and shunt type ammeter. Installation only requires the customer replace the stock external regulator with the one provided, install the alternator and our 3-wire plug, then make one crimp connection from the original wires at the alternator. All alternator upgrades require a large (#6 or #4 gauge) wire be run from the output of the alternator to the vehicle harness. Direct reading ammeter should not be used or should be bridged due to the significant increase in measured amperage with upgrade alternators.